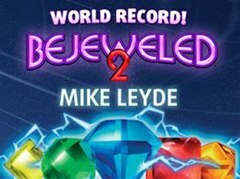 Video game ranking site VGChartz reports that Mike Leyde, a 56-year old steel contractor from Riverside, California, has broken Bejeweled 2's scoreboard with a score of 2,147,783,647. "The highest score the game is capable of calculating is 2,147,483,647; that's 2 to the 31st power minus 1. We had to give the game some sort of maximum displayable score, and figured that was high enough, no one would ever get that many points. When Mike collected that next gem match, the additional 2,200 points would have put his score above the maximum 'calculable' score, and much like some of the original arcade games, it caused his score to 'flip around' to a negative number. Well, the game's code wasn't designed to display a negative number so it just showed a blank where the score should be!" Married for more than thirty years, Mike also excels as a family man and parent and grandparent, spending a lot of time with his three kids and four grandkids and staying in touch with his eight brothers and sisters. 'Growing up, we siblings knew that if we couldn't figure something out, Mike could and almost always would,' says Mike's sister Jana. 'Things that would challenge anyone else just seemed to come easily for Mike, and he's always been driven to succeed, which makes for a powerful combination. He was an excellent chess player in his younger days, finished school early, and so forth. It was fun to watch him set his mind to achieve a goal that most people would just consider impossible, and make it a reality!'"